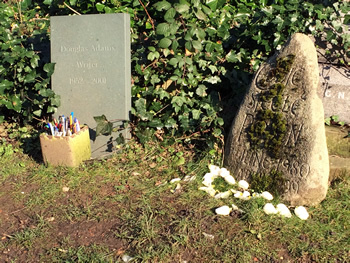 This journal entry from my ongoing exploration of famous historic locations of England, saw us take a walk among the tombstones of Highgate Cemetery today. Described as “One of England’s Greatest Treasures” and divided into the East and West cemeteries, Highgate is the final resting place of many famous names including writers Christina Rossetti, George Eliot (Mary Ann Evans), Douglas Adams, Radclyffe Hall, Karl Marx and my own personal favourite from today, chemist and physicist Michael Faraday. Located in North London, Highgate cemetery quite interestingly has a de facto status as a nature reserve and is designated Grade I on the English Heritage Register of Parks and Gardens of Special Historic Interest in England. After a few minutes there it is easy to see why as the cemetery is filled with wild-growing shrubbery and trees. 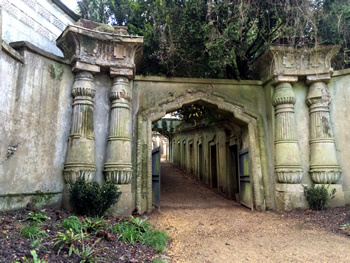 Despite the cemetery’s desperate need for funding, this historic site is really well cared for by the Friends of Highgate Cemetery Trust, which itself is run by volunteers, supported by paid staff and countless volunteers who do everything from guiding tours to helping maintain the landscape. The price of entry is very affordable and goes towards conservation of the Cemetery as well as an ongoing work to secure the repair, restoration and preservation of the Cemetery for the public benefit. The tour of the cemetery is well worth the price, as it takes you around the West, which is presently closed to the public and if that is not enough incentive, your tour ticket also allows you to visit the East Cemetery free of charge, for up to thirty days after your purchase date. Highgate Cemetery is an enjoyable and worthwhile day out.